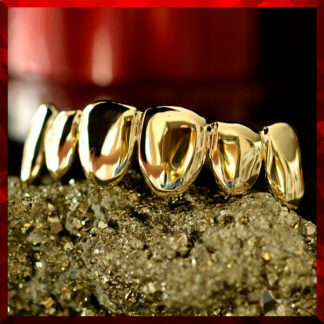 Gold Teeth | Grillz - #1 Gold Grillz Online Store - HUGE SALE!!! If customers cannot find the design that they are looking for, we offer a custom-design process where customers can request for a specific design that is to their liking. Our two-step shipping process is simple. We first send out the molding kit and provide a paid return package included. Customers simply make the mold of their teeth with the instructions provided in the package and send the mold back in the paid return package. Once we receive the mold at our company, our designers quickly but precisely turn the mold to its perfection and ship it back out to the customer. Our customers will be able to receive their product within a quick turnaround timeframe. All of our merchandise are 100% handmade, with precision, so customers can be reassured that their purchase is being carefully made. Our designers spend a great amount of time on each item so that each product is accurately crafted. For our iced out products, our designers carefully place each crystal, one by one, to its perfection. The purpose of our product is specifically for jewelry purposes. Our products are not meant for any medical purposes, teeth replacements, or dental procedures. Our company was first started in 1997 in New York City. Due to our increasing popularity, our team then dispersed out into the major cities such as Los Angeles and Atlanta. Our headquarters is now located in Atlanta, Georgia, where we attract many loyal customers who are in need to style their teeth with bedazzled crystals. 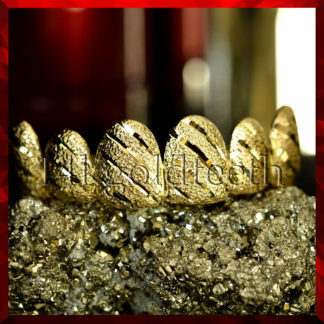 Often referred to as “grillz”, or “slugs”, our product is truly one of a kind. Our designers are truly important to us as they dedicate their craftsmanship and meticulous skills in making fine jewelry. All of our merchandise are handmade by the finest designers, and customers can inspect their products for perfection. All of the products at our company are known for its unique design and quality. Whether customers want something simple as stars and fangs to white diamond cuts in their merchandise, we offer it all. Here at 14kgoldteeth, we offer the cheapest price online. However, we offer the best quality grillz for the best price in town. 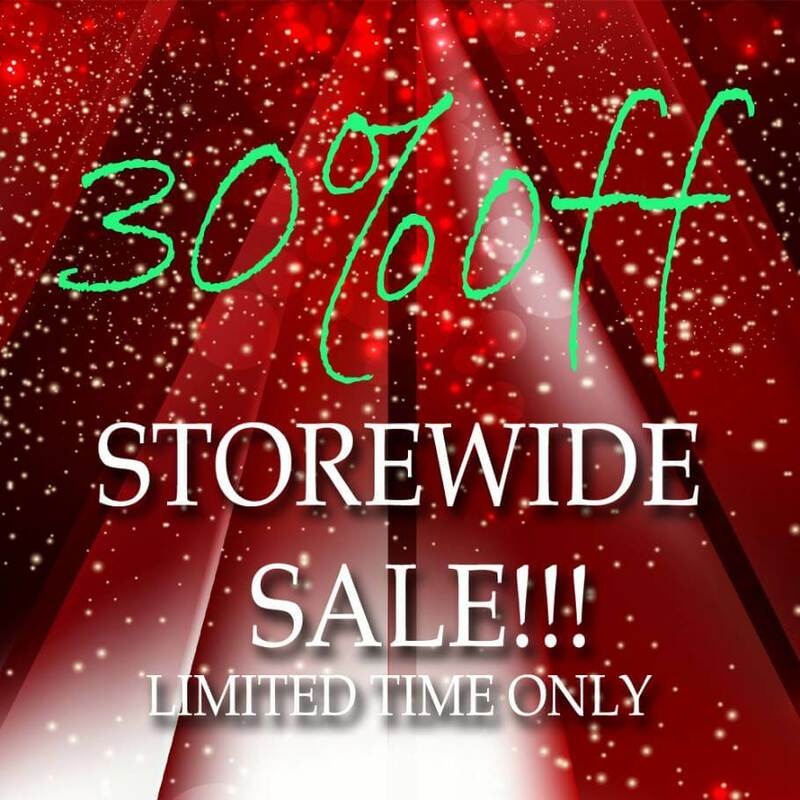 We offer the lowest price for our handmade merchandise because we want every customer to be able to experience the best product in the world. Because we value every customer who shops with us, we offer exemplary customer service across all of our divisions. Customers can call us anytime, and if we do not answer the call, we give a return call within the span of a few minutes. Customers can also contact us through email, where we have a representative who replies quickly and efficiently to every email received. On our website, we offer an online chat where customers can immediately ask questions about our products and receive responses from our online chat representative about any item that they may have questions on. Whether our customers have questions regarding pricing, shipping, or the design of their wanted item, our online chat representative has the answer to each and every question for the customers who takes advantage of our online chatting system. Our customer service representatives are always available and will be happy to assist any customer in purchasing their perfect product. 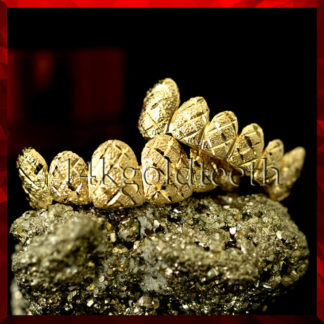 At 14kgoldteeth, we would love for our customers to get involved with us. We have a social media director who personally manages our Instagram page @14kgoldteeth. Our Instagram page has wonderful pictures of the different types of products we make, our happy customers with their purchase, and special promotions. As you can see, the best place to buy custom gold teeth is right here on our site. We are truly proud of the products and services that we have to offer each and every customer. Our product is rated as the best in the world, and we would love for everyone to experience our fine gold teeth. Gold teeth is a very popular trend that is on the rise in today’s world. It is not just a set of teeth that fit into your mouth, but it is rather known to be a type of jewelry. The product is specifically categorized into hip hop jewelry, and many of the hip hop and rap fans wear it. 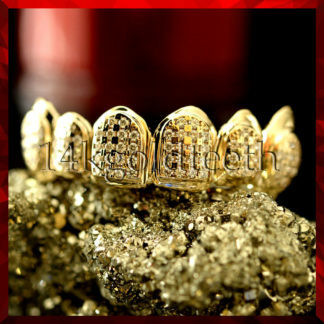 Custom gold teeth is not only for the fans, but also the rappers themselves wear it as well. Many different fans wear grillz, such as the fans of the rising star Post Malone, fans of the hip hop mogul Jay-Z, and fans of the rap superstar Lil Wayne. These are only a few of the many different celebrities who proudly wear these luxury items. Although the trend of real gold teeth began with hip hop and rap, nowadays, everybody is wearing them. First, Jay-Z wore them and then along came Beyonce who now has a pair of her own. Pop singer Katy Perry even has a pair of her own that she proudly wears with a great big smile as she walked the red carpet for the MTV Music Awards. Non-music artists, such as model Kendall Jenner, magnificently wears her pair even overseas in London. As viewers can see, this fashion style is not only limited to a certain group of people. This custom made product is for all ages, all genders, and all types of people. Custom gold grillz is a product that is custom made to fit your teeth. Because everyone’s teeth differ in size and shape, there is no one way to make a type of product to fit perfectly. That is why people want a custom made product. The product is tailored to fit flawlessly into their teeth. 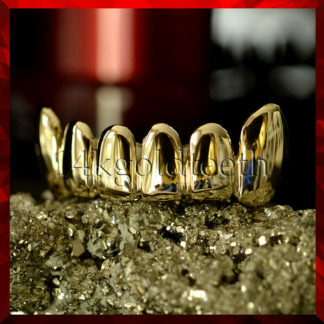 Here, at 14kgoldteeth, we want to help everyone get their own affordable custom grillz. With today’s technology and advancements, we can create an imprint of the mouth and turn it into a glamorous product. All of our gold teeth are created using real gold and silver. None of our products are plated, so the items are 100% guaranteed authentic. As seen through celebrities and rappers, each person has a different style, which means that their real grillz will also vary in style as well. We know that each person has a different style and preference, so we offer different types of products to accommodate the needs of our customers. We offer the yellow gold, white gold, rose gold, and silver metals. Yellow gold is a classic, timeless metal that has been around for centuries. White gold has not been around as long as yellow gold, but it does offer a modern twist. Rose gold has been one of the trending metals that everyone enjoys. Silver is another metal that has been around for centuries, and it is a popular choice for accessories. Many people choose different karats of gold due to preference, so we offer our gold grillz in different karats to accustom to our clients. In general, the number of karats is determined by the amount of gold used in the product. The higher the karat number is, the more gold there will be in the product. Our yellow gold comes in 10k, 14k, and 18k. Also, both of our white and rose gold come in 10k and 14k. We use 925 sterling silver for all of our silver grillz. We offer a range of pieces from 4pc to 8pc and even gold teeth caps. There are options for every category that customers won’t be able to refuse. Customers can also decide which style they would like. Our designers hand craft each design with precision so the designs on the items are impeccable. There is a wide range of styles that we offer. Some styles are more simplistic, such as the solid gold teeth, but other styles can be more sophisticated, such as the diamond grillz. There are also other unique designs such as the open cut, deep cut, diamond cuts, and diamond dust designs. No matter what design customers may choose, their custom teeth will look fabulous on them. Are grillz safe to wear? Wearing grillz has been an increasing trend over the years. Commoners and even celebrities have been identified for wearing grillz. This style is a great way to show your personality to the world with a big, flashy smile. Many have seen celebrities and others with this dazzling look, but they may ask themselves if it is safe for them to wear. Our gold grillz are very safe to wear. People may have doubts whether or not the product is safe for them. While some other places sell plated teeth or mixed metal teeth, our company does not use any harmful metals or chemicals that can harm your mouth. At 14kgoldteeth, we use real gold and real silver. All of our gold products are stamped on the back to indicate the purity of the gold. Currently, we do not offer permanent gold teeth, but our product does have a permanent look, so customers can confidently wear their custom gold teeth and remove it at a later time. Since all of our products are custom made, the item should fit properly onto the teeth. Customers should wear their teeth with reason and properly clean it after each wear. As long as these tips are practiced, there should be no harm in their dental health. 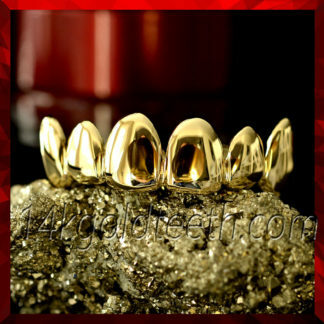 Get cheap custom grillz here at 14kgoldteeth! Nowadays, people have hectic schedules even on the weekends. Some may even wonder if they will ever have time to go to the store. As the population keeps increasing, and more and more people are driving cars to take themselves places, it cannot be helped that traffic is also increasing. Depending on the location, it may even take some people hours to get to the nearest store to order a set of yellow gold grillz. For those with busy schedules or for those who just don’t want to leave the house, we have the perfect solution for you. We are an online company, so we will basically come to you! There will be no need to get into a transportation vehicle and search for the nearest store. Our process is convenient for the customer, and it is also a hassle-free process. As soon as the order is placed, our team will ship out the molding kit to receive an imprint of the client’s teeth. Another convenience for the client is that there is a prepaid return postage so there will be no need to find a box and purchase a postage. All of that will be taken care of at our courtesy. The final product will be sent to the customer and the customer can happily open his or her anticipated package and flash a huge, shiny smile.